I packed this bento as the last Valentine theme bento. I made the little birds flying around. Only used small cutters to make this bento and pretty quick to prepare. Inside the box :rice, strawberries, tamagoyaki, garlic prawn & carrot-cucumber salad (sauce on separated box). Project cookies pops has been failed. It was my idea to make that for kids' classmates but then my kids said it was too big to decorate. And they wanted to make heart shaped cookies instead. So we started baking the cookies on Saturday and kids decorated the cookies on Sunday. I took some of kids' pictures in the kitchen with my mobile phone before they 'banned' me from the kitchen. Funny though because my kitchen was separated with the big glass door so I could still see what they were doing with the cookies LOL :D I posted the pictures on my twitter (you can follow me here). They had a lot of fun decorating the cookies for 3 hours. They decorated 150 cookies by themselves. So each of them brought 75 cookies to share with their classmates, teachers, and they said they wanted to give it to security and cleaning service staffs too at the school. Each one of the cookies had a different design on the top with the icings that I made. Didn't know how they could do that, they just kept floating the cookies with the icings. They had a lot of fun and I was happy to see their exciting face holding a box full of their homemade cookies. We always teach the kids to share and to care. This is just a simple thing that they successfully did. I'm very proud of them. Pretty bento with cute ideas as always Lia. Happy Valentines Day! Happy Valentine's Day to you and your family too Lia! Lovely birdies, its amazing how fresh the prawn looks, did you stir fry them? How nice of your kids to share their love with others.. I think it all started from mummy making bentos for them..
Hyvää Ystävänpäivää! (< Happy friend´s day!). Happy Valentine´s day Lia! 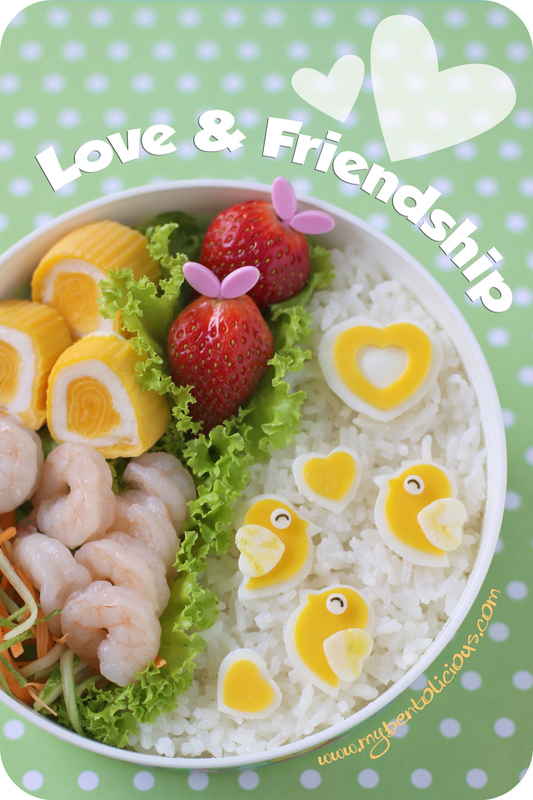 Love-birds in the bento are also so sweet ♥! @Ni-chan : Thanks a lot! Aw... too cute! Even perfect tamagoyakis here... How sweet are your kids to want to make, decorate and give cookies out on Valentine's?! Wow.. they are sweet kids Lia. You're doing something right with these two. : ) 150 cookies.. they have patience! lol. Have a sweet Valentine Lia! Hi, Lia. Happy Valentine's Day to you and family. @Emily Ng : Thanks a lot Emily! Enjoy your day too with your family ... Happy Valentine's Day! Your kids have a lot of patience decorating that many cookies! Sounds like a lot of fun though. I love your birdies, gorgeous bento Lia!! @mama elaine : Thanks a lot Yuli! This is very pretty! Hope you had a great V Day! Lia the love birds are so sweet! What a gorgeous bento! this is sooo wonderfully cute!!! Hope you had a great valentine's day! @Juliana : Thanks a lot Juliana! Oh dear, how can I missed so many of your lovely bento!!! I must spend some time catching up since I'm back from my long holiday break! Sorry to come to this beautiful post late, hope you had a great Valentine's Day! These love birdies feel close to my heart!